(CNN) -- Authorities have found a massive underground drug smuggling tunnel snaking through the U.S.-Mexican border, and law officers are marveling over its sophistication. The uncompleted tunnel measures 48 feet in the U.S. and 35 feet in Mexico. 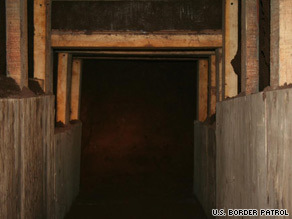 "This is one of the most elaborate tunnels I've seen," Border Patrol agent Michael Scioli said. Border Patrol agents found the uncompleted tunnel last week, the patrol said in a statement. Measuring 48 feet in the United States and 35 feet in Mexico, the tunnel contains side walls framed with 2-by-4 wooden studs and ceiling construction. "It's elegant in the sense it has electrical work wired into the Mexico side. It even has a hose for ventilation and lightning," Scioli said. The development points to successes law officers are having in uncovering the tunnels, with an additional 16 tunnels found since October 1. But it also underscores the skills and savvy of the drug smuggling industry. A resident tipped off the patrol about construction activity through the wall of a building in Nogales, Arizona. Agents arrested two people cutting a hole.